RETIRE IN STYLE BLOG: Ready, Set, GO! I saw this on Twitter this morning. Even though it was a Tweet posted by an educator, it reminded me of the thought process some people have about retirement. Did you feel like you had "arrived" when you retired? Or did you see a future beyond the gates of retirement and a whole world on the other side? It could be that what we see after that work life will simply be a self fulfilling prophecy. I do hope that you have or had many ideas to chose from. I think that is the key. I suppose if you have always been an armchair kind of person you will not change now. But you can! That is the point. 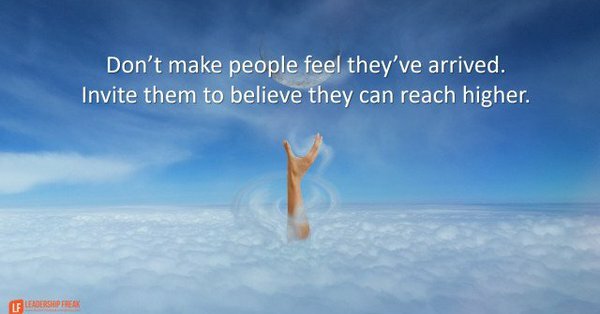 The Point: Don't ever feel that you have arrived...believe you can reach even higher! It just gets better and better. Ready, Set, Go! Have fun! Good reminder. At times, we lose our focus on just what we wanted to accomplish in retirement. That is so very very true. But even if we lose our focus, we can continue to reach for the stars! Yes, let's keep learning and aiming high in retirement. For me part of that is completing writing a children's book and finding a traditional publisher for it. We all can have wildly different goals. I do so admire you goals Terra! let me know me know when you do get that published! QOW! I LOVE this mindset, Barbara. Thanks for another great reminder! In the train to life there is no arrival...at least that is what I believe. Have a great day DJan! That's an interesting concept. I think in a way, I HAVE arrived. I'm happier than I have ever been in my life. I'm so content. I love my life and I'm so grateful every day. To me, having arrived doesn't mean doing nothing. I'm active and still engaged in many things. So your post made me realize that there are different ways to think about that word "arrived." If it means giving up because there is nothing left to look forward to or work for, then I see it your way. But if I think about it as having arrived at a state of mind that is happy and full of gratitude, then arriving is a good thing! Thanks for stretching my vocabulary! I have always been a "what is, is" kind of a person. Accepting life as it happens and finding good in where I am is always on my mind, even when thing go very wrong and it does. As for arriving, I think that a lot of people sit down when they have arrived. The point is, I think, that we need to keep looking new learns to learn. I know you are doing that always.